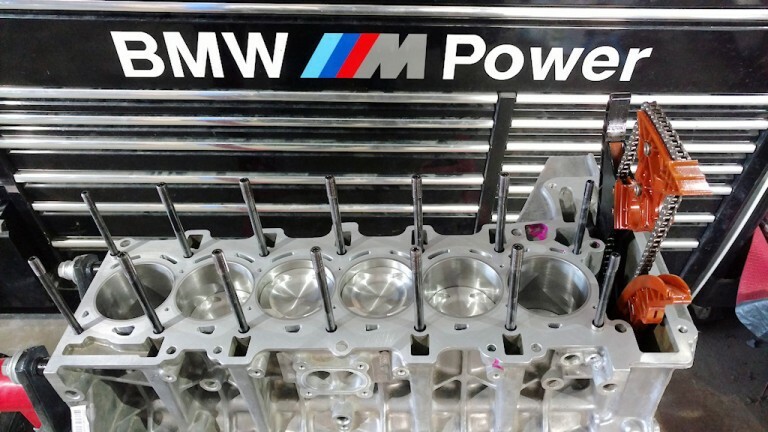 Our N54’s and other BMW engines can be custom built to your specs or needs. Each engine is hand built, with attention to detail to ensure the best quality build is available. The block is set up on a custom built plate to hold it in a 5 axis CNC machine. We Machine the lip into the cylinder walls and block walls to accept our closed deck conversion insert. Warming the block up and freezing the insert, we press it in with about half a thousandths press. It’s permanently installed, and machined flat with the top of the block deck. This significantly strengthens the issue of an open deck block- where the tops of the cylinders will “wobble” or move under heavy load. By doing this, we’ve yet to see the limit of the block (so far). Typically we see an average oil and coolant temperature increase of 10-15 degrees due to the insert design (which is unavoidable). This is nothing to be concerned about, as most big engine builds will have upgraded oil cooler and coolant systems. To show the difference- this is an open deck block, how the N54 came stock: This engine was a mild build with only JE pistons and head studs. Typically we recommend this on anything from completely stock daily drivers to about 450-500 rear wheel horsepower. This is an N54 block in process of close deck conversion. 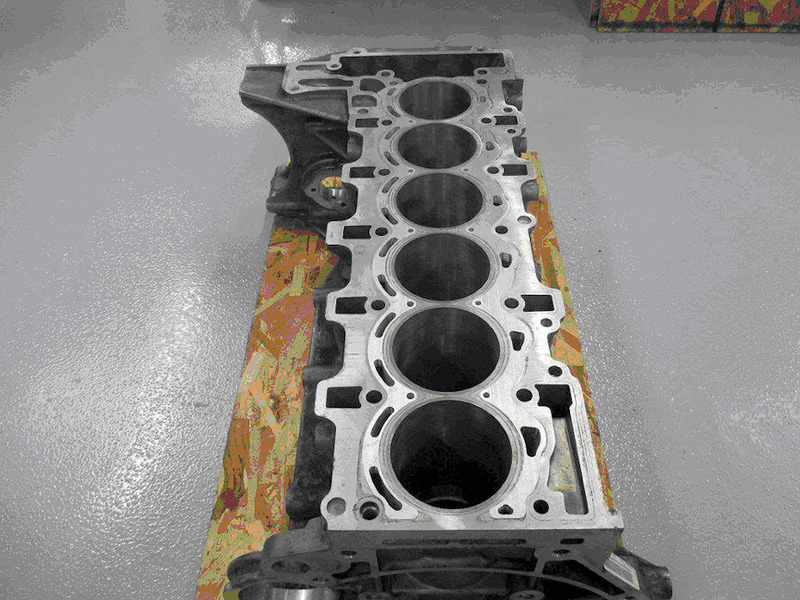 The block is still dirty/not machined/honed or ready for assembly. The insert was pressed in but is “proud” sticking out of the block about .030” so when the top of the deck is machined flat, the transition is seamless. 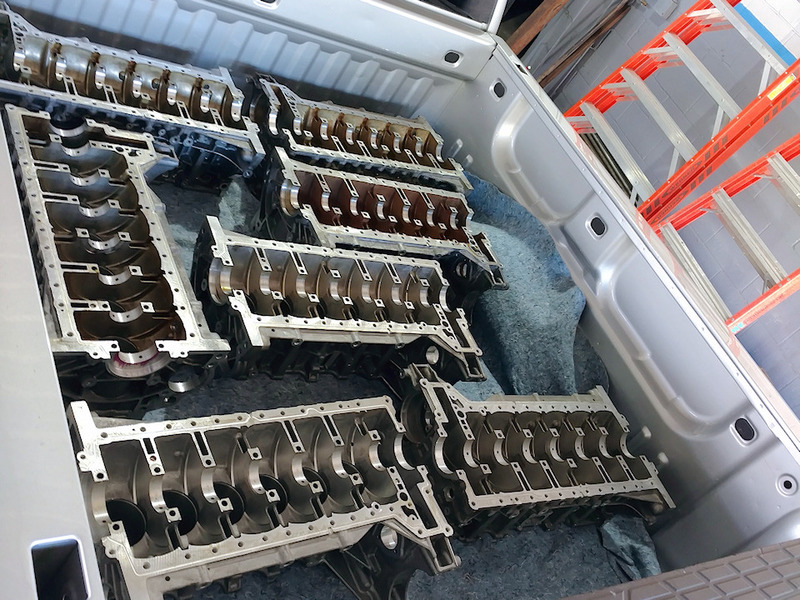 Another batch of N54 engines going out to be close deck converted at the machine shop. And this is a closed deck that is ready to go. Notice how only the difference in aluminum color is the only thing that differentiates them, and even that is difficult to see. ARP2000 material, no modification drop in. 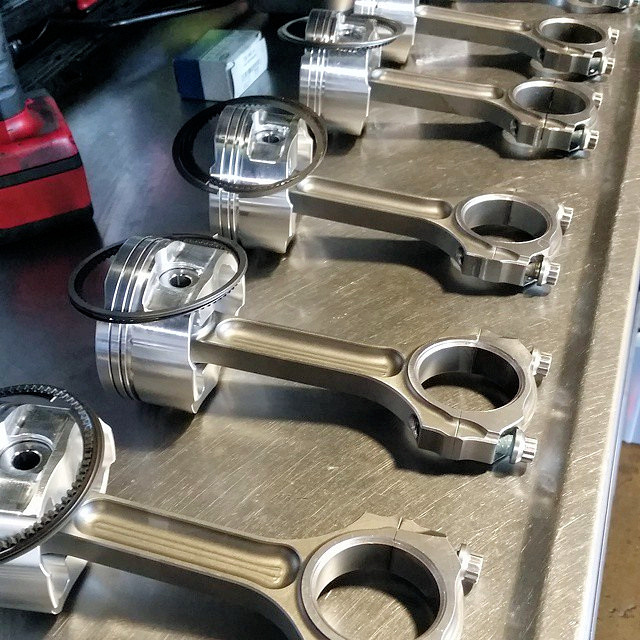 Installation requires the camshafts to be removed/shifted out of the way, due to the nut and socket configuration. Because of this, please understand that cam timing and cam trays will have to be reinstalled- Watch the following video to understand cam trays and VANOS. They can be installed in any N54 engine with a 4340 chromoly spacer, or during our engine builds without a spacer. They are a GREAT upgrade for any person wanting to push 20+ PSI and we highly recommend them on any engine other than completely stock engines. Why are our head studs more expensive? The main reason is our head studs have 33% more thread engagement into the block vs. our competitors. Yes, their studs may be more attractively priced- but do you really want to skimp on the reason you’re using head studs in the first place? Get the right ones, the first time. Recently our competitors have ditched the off-the-shelf Chrysler stud they were using (and selling much cheaper) and have mimicked our set. Imitation is the best form of flattery, I say. All components thoroughly checked and inspected. Proprietary set up and custom made jigs to perform machine work, and assembly. All fasteners marked after torquing. This is great bang-for-your-buck since the multi angle job will dramatically change flow results over stock valve angles. We have this on our own loaner car. Come feel the difference! We recommend this up to about 600 WHP. It'll work on higher power, but it's not the best choice as it'll act as a bottle neck. Expect a pressure drop of 1-2 PSI, and approximately 10% more fuel needed. Example- A single turbo 135 we put together ran out of 93 pump octane at only 17psi. Typically a single turbo on a stock cylinder head can run about 19psi before this happens. We had to install a secondary fuel pump and controller, due to the single performance pump was unable to keep up with the demand. 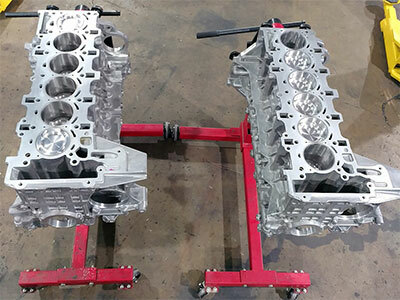 Expect to upgrade your fuel system and tune, as these heads *will* need additional tuning due to their proven flow numbers and easy horsepower gains. 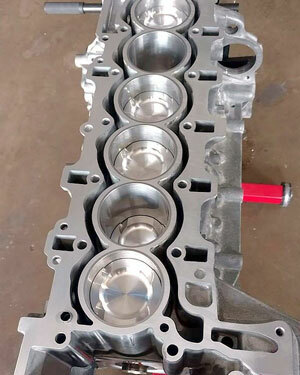 All rough castings are cleaned up in the ports, attention is spent near the valves. This would be considered a “mild street” cylinder head. We recommend this up to about 700 WHP. It'll work on higher power, but it's not the best choice as it'll act as a bottle neck. Expect a pressure drop of 2 3 PSI, and approximately 10-15% more fuel needed. a full port and polish job. Custom race angles and proprietary cuts are used with over 30 years of race engines being built and developed. Cylinder head is match flowed and optimized. This would be considered a “full race” cylinder head. With Ferrea valvetrain, we recommend this cylinder head up to 900 WHP. Expect a pressure drop of 3-8 PSI, and approximately 30% more fuel is needed. This is the highest performing N54 cylinder head on the market. 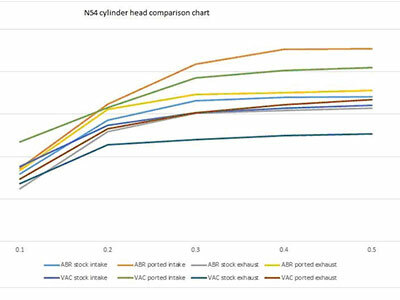 Our competitors claim they have a better head- we tend to disagree. 818 whp @ 30 psi. That really is low boost for those numbers. Typically 650 hp on a stock cylinder head takes about 30 psi. 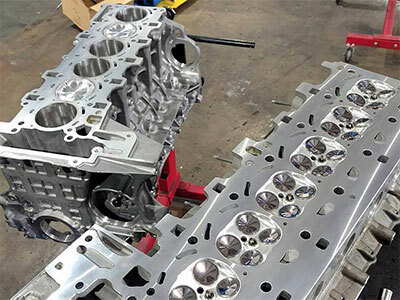 The more cylinder head work you can afford, the less boost you'll have to make- which helps turbo efficiency, and intake temperatures. Our flow bench is very stingy, and it shows great results. These are custom pistons we order directly from JE Pistons. We are now using our custom JE Asymmetrical piston skirts as of Q1 2018! Anyone worth their salt in the performance world knows about JE pistons. They are the leaders in performance pistons. Custom low friction coating available! 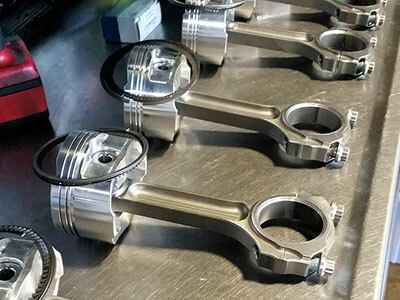 *Note* we cannot order pistons until we can ensure the honing process has been performed and is uniform to maintain proper piston to cylinder wall clearance. JE turbo piston rings are used and are hand filed and fitted individually to each cylinder. We’ll then install them on the piston, and mark them which cylinder they go into when you order them. We recommend Ferrea valvetrain on any performance head. Nitrating and custom coating is available, please contact us. We do more than just N54’s! We can rebuild any BMW engine for that matter. Here’s just a few engines we have built or repaired. Can you tell me what the core charge will be? Each engine is unique. Some clients want “extra credit” work done. New oil pump, installed turbo’s, installed injectors, new valve cover, etc.etc. This can VASTLY change the price. Just look at this one- it was practically a drop in. Built engine, new valve cover, turbos, inlets, high pressure pump, oil pan, injectors, and spark plugs. Can you just send me a built bottom end? Visit our Build Your Own N54 page and order one today! Can you sell me a stroker kit? Yes, we can supply a complete bottom end, ready to go but cannot sell the individual parts due to the extensive machine work needed. Visit our Build Your Own N54 page to get started! Do you provide a warranty on these performance engines? If there is a question of workmanship on the engine, we will stand behind it without a problem. We stand behind our products without question, but even a knucklehead can break a bowling ball with a sponge hammer. We’ve seen it firsthand! Because we cannot protect the engine from poor fuel, poor tuning or someone who doesn't know what they are doing, it’d be impossible to warranty it. If we see signs of abuse (knocking/detonation/poor tuning) or poor judgment (overrev/misshift) we cannot warranty negligence. See warranty page for more details. OK, but really, what will this cost? Our engines start at 1999.95! 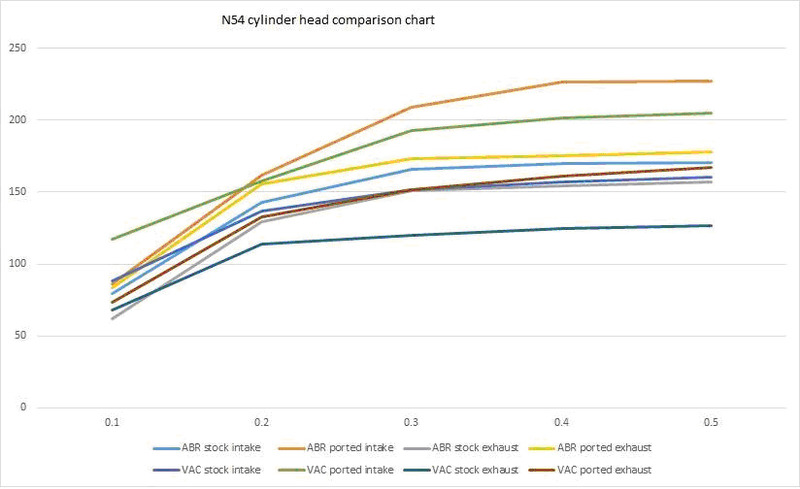 Really, it does make a difference to know your horsepower goal and budget. Typically that’s how we start every single conversation. 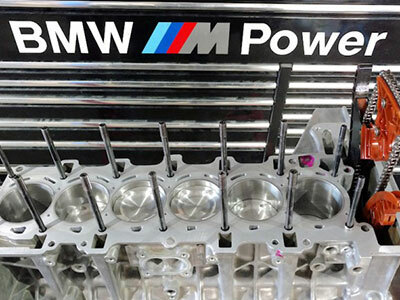 Recent parts from BMW have SKYROCKETED some of the required parts in the engine, as well. 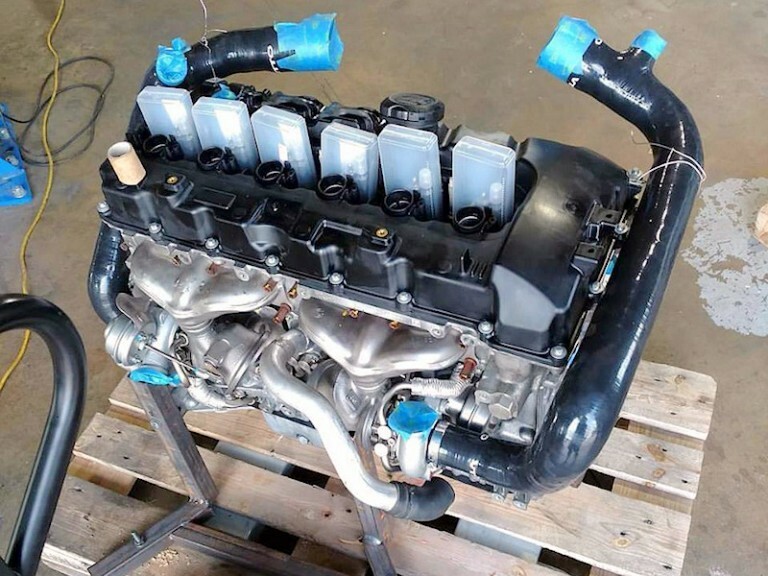 A fully built engine ready to drop in can go well north of $10K. If you have specific needs, let us know. Bro, sponsor me. Give me an engine and I’ll be in magazines and videos. Ok, so we get this a lot too. We have sponsored drivers and vehicles at ABR Houston, and they did it the right way. They presented a minimum season schedule of events they are going to, presented a reason for us to sponsor them, showed us the benefits and return on investment for the sponsorship and agreed to rules and terms that we set up to sponsor them. We then drew up a contract and off to the races, so to speak. If you’re interested in sponsorship, you better be ready like a job interview, and show us why.